Jeff Lemire's Animal Man has been exemplary so far, and Animal Man Vol. 3: Rotworld - The Red Kingdom is no exception. Not only does Lemire tell a surprising, scary, action-packed, and ultimately moving story, but he also carefully navigates that tightrope where so many writers before him have fallen: the dreaded comics crossover. There's great writing here by Lemire, great art by Steve Pugh, and Lemire and Scott Snyder have together constructed an impressive crossover that never feels slow nor padded and treats both the Animal Man and Swamp Thing series well. Rotworld is a good story on its own, but it bears mentioning again at the top the art of Steve Pugh (himself a veteran of Animal Man iterations past), which really makes this a must-check-out book. Pugh's work in this volume, which is somewhat heavily inked and dark, color-wise, wouldn't be right for a Superman or Teen Titans comics, but in Animal Man what I think we want is uniqueness, not necessarily clarity. But in Lemire's tale of a dystopian future ruled by the deadly Rot, Pugh delivers some of the most grotesque figures I've ever seen, misshapen humans with brains coming out of arms coming out of their heads. To some extent Rotworld even out-does Geoff Johns's zombie-fest Blackest Night, with Rot-ified versions of a cadre of DC heroes (his Cyborg struck me as especially unpleasant). Pugh's Rotworld is gory superhero horror at its finest. But again, Lemire's story is no slouch, either. Rotworld is so readable because Lemire populates it with especially interesting characters. Were Animal Man Buddy Baker just to have met up with the Justice League in Rotworld, the story wouldn't be nearly so engaging, but instead Lemire teams him with Superman's Steel, Justice League Dark's Black Orchid, and then-Ravagers (and now Teen Titans)'s Beast Boy, three heroes deserving of spotlight and whom you'd never have expected to see together. (Lemire used much the same formula when he breathed new life into Justice League Dark.) Add to that Frankenstein, a character Lemire has written well in the past, and then book is off to a good start already. As well, while many crossovers tend to fill pages just with action, Lemire sends the characters on a couple of "quests." This, too, is a form of page-filling, simply walking the characters from one location to another, but the "questing" atmosphere worked well with the almost swords-and-sorcery tone that the book takes in the quasi-medieval Rotworld. And Rotworld is filled with so many cool moments that utilize the entire DC Universe, from the various zombie heroes to unexpected villains like Blackbriar Thorn and Felix Faust (each late of Lemire's Justice League Dark), or the surprise appearance of Green Lantern Medphyll and then later, the crowning of Frankenstein as a Green Lantern(!). As a continuity nut, I also appreciated that Lemire, even within the confines of the "alternate reality" Rotworld, still managed to add to plotlines spread across the DC Universe. He touches a bit on the yet-unexplained origins of Beast Boy, and I know from looking ahead that a foe of Beast Boy's from Ravagers will be troubling Buddy not too long from now. Lemire also hints at the origins of Black Orchid, whom he himself introduced in Justice League Dark, offering up the mysterious "Project Taproot." To some extent I thought this was just a throwaway tease for Dark, but then Taproot comes up again later in the book in a way that suggests Animal Man might have more to do with it. Rotworld - Red Kingdom arrives where Animal Man has been hinting it would go for a while -- the death of Buddy's son Cliff. That it's a Swamp Thing character that does it, rather than an Animal Man character, fully realizes this as a "crossover" that works. I suspected it was coming, but then Buddy has a vision that says "the boy ... won't be dead yet," and I dared to think Cliff might make it out alive; only in retrospect did I realize the vision meant the young William Arcane, who kills Cliff, and not Cliff himself. This is a dire turn for the book, one that makes me wonder how Lemire can ever portray Buddy as a "happy" hero (which he generally has been) ever again. I tend to side with Buddy's daughter Maxine here that maybe indeed Cliff isn't dead, but I also recognize that, as a cat avatar points out in Lemire's emotional "The Funeral" issue (#19), as being perhaps a bit of denial. Then again, this will not be the first time members of Buddy's family have been killed and resurrected, so maybe Cliff's fate remains to be seen. The book owns up to another bit of its foreshadowing in the end, when Buddy becomes essentially his character from the in-story movie Tights, a washed-up superhero and estranged from his wife and family. Lemire's Animal Man has been a story about family, and again, it's teased Tights from the start, so I trust Lemire knows what he's doing. I bristle slightly at the portrayal of Ellen Baker as "shrill wife who can't understand her husband's just trying to save the world," but again, I trust that Lemire has somewhere specific he's going with all of this. 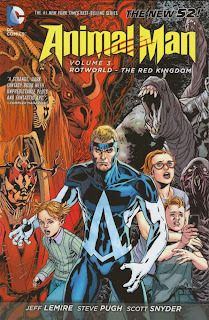 In terms of the crossover aspects of Rotworld, I had read Animal Man Vols. 1 and 2 and also Scott Snyder's Swamp Thing Vols. 1-2 before I read Red Kingdom, and I was not at all confused about who was who or doing what. The structure is that Animal Man and Swamp Thing come together for their issue #12s (both of which are collected in both series' Rotworld volumes), then each series goes its own way for issues #13-16, and then they come back together for the issue #17s (again double-collected). There was a little bit in Animal Man #17 where I didn't recognize some members of Swamp Thing's Rotworld team, but that hardly detracted from my enjoyment. If you were going to read the Red and Green Rotworld books together, you might read Animal Man #12 and Swamp Thing #12, then issue #13-#16 of Animal Man and issue #13-16 of Swamp Thing, and then finish the two books off (issue #17 of each and then on from there) and you'd get the whole story with reasonable cohesiveness. There's no better news than that Jeff Lemire keeps "ownership" of Animal Man, moving over to Justice League United. Animal Man Vol. 3: Rotworld - The Red Kingdom is a fine piece of work by Lemire and a worthy next chapter in the series. I'm happy to see Lemire writing about Animal Man for a long time to come. Next week, more Animal Man and Legends of Red Sonja. Don't miss it! Do you think that crossovers like this generally play better in the trade format? You say that it never feels slow or padded, but I heard nothing but complaints about this event. Most of those complaints were that it was good but went on for way too long. When you read it as a trade you can get through it in an evening if you like. If you follow month to month it takes a full year or so. Do you think that can hurt an otherwise strong story? I haven't read this crossover so I could be wrong, but the story may seem shorter in this case since the titles took their own stories and only really crossed over at the beginning and end with 13 and 17. If you were reading monthly with both Swamp Thing and Animal Man, the story would be nearly twice as many issues. Comics are obviously designed for month to month but I much prefer them in trades like CE seems to. Whether itsva crossover or just any story in the regular monthly books, I hate waiting for the next part and prefer to "binge" read the whole book. 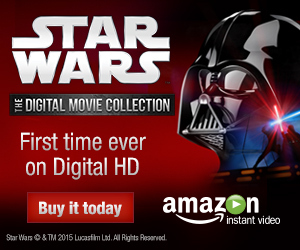 In that case I would say most stories benefit from trade waiting, at least for my tastes. However, I could name a few books which did not read well as a trade and probably would have been more pleasing in smaller monthly chunks. Peter Milligans Red Lanterns titles so far have really seemed to be slow and repetitive, making it hard for me to keep reading the trade. Maybe I would've been more optimistic had I read little bits over time? Anyway, as I said I've not read this crossover so forgive me if I'm totally off base here. I'm interested to see how CE feels about this and other events in the trade format. It really depends which on-going you follow, I think. I initially only followed Snyder's Swamp Thing but when the Arcane story lead into Rotworld I wanted to read Animal Man too, to get all aspects of it (I didn't know much about it except that Grant Morrison had a trippy run on it). In the end I felt this was (despite Lemire writing a very good Animal Man) a bad decision as Animal Man even more leads into Rotworld. Now you have two titles that in its first two trades (or 12 issues) leading into Rotworld which then tells two sides of the same story (with overlapping issues in both trades) ending at issue 17 (I think) and two annuals which made this feel bloated for me. You could skip either Swamp Thing or Animal Man but you'll feel like you missed something when Buddy arrives at Arcane's doorstep with Swampy bringing in a huge Batman-robot without knowing how he obtained it. If you want to skip one of the trades I suggest skip Swamp Thing as Animal Man is the (IMHO) stronger one. Reading both titles simultaneous might be the best option IMO. But like I said, in the end it's a pretty long story that probably shouldn't have been. I think that both vol. 2 trades would have benefited if they were half in size. Theoretically, what Dijonase said sounds right, yes, that a crossover maybe reads better when you can digest it all in one trade (and then in my case, immediately go on to the non-crossover Animal Man Vol. 4) than it does when you're spending a year reading a crossover in single issues. Obviously I can't speak to all of this because I only read Rotworld in trade and not single issues, but again, theoretically, yes. But i would still say that Lemire and Snyder got something right in their construction of this crossover that, say, Lobdell and company didn't get right in the Superman: H'el on Earth crossover, for instance. Lemire and Snyder join up Animal Man and Swamp Thing for the books' issues #12 and issues #17, and otherwise #13-16 of each series is independent. I felt like this was "just enough" crossover that I felt like I was reading a shared story, but also I never felt like I wasn't reading an Animal Man story nor that the Animal Man storyline was derailed for too long. Superman: H'el on Earth I did think went on too long and felt padded, because it was fourteen (!) issues, and each one connected to the one before, so I thought at times there were too many fight-scenes-for-fight-scenes'-sake and also that the story at times went on unnecessary tangents in order to fill pages (the Superboy Annual, for example). Rotworld is just two issues shorter, but by virtue of how the writers constructed it, I think they were able to meander less and focus on their specific characters more. It was in a way that felt natural, too, whereas Green Lantern family crossovers are often like "Look at this character! Now look at this character!" as you change from title to title, but Rotworld wasn't like that because it was in part parallel, not connecting, stories. Sure, I agree with shag that not every book reads best in trade -- Legends of Red Sonja, which I just finished, did not read well in trade -- but yeah I prefer "binging" on a storyline than stretching it out over six months, too. Daniel's correct on Rotworld, however, that if you just read one title or the other, you may not recognize some characters in the issues #17; this didn't throw me too much, however. If you're looking for a reading order, I'd read Animal Man Vol. 1 and 2, then Swamp Thing Vol. 1 and 2, then Animal Man Vol. 3, then Swamp Thing Vol. 3. If you're reading the Rotworld single issues, as I mentioned in the post above, read Animal Man #12 and Swamp Thing #12, then Animal Man #13-16, then Swamp Thing #13-16, then Animal Man #17 and Swamp Thing #17. I'll just chime in here as a monthly reader of Swamp Thing and Animal Man and say yes, the length of this story was agonizingly long and slow, and I quit both books soon after. It felt horribly paced stretched out over a year. I wish I read it as a trade instead. In fact these 2 series are one of the main reasons I am mostly off single issues. I just don't think stories like these are meant to be read in small monthly chapters. I think single issues work best as stand alone stories (see the latest Snyder Batman issue, which is a great creepy stand alone.) Or Paul Dini's Detective run.